As if telling us that they are still up and running, the folks at Digg has been sending out noisemakers one after another. Digg has just released the buttons and widget generators while a native iPhone app is in the pipeline. The new Digg native iPhone app is not yet announced but Mashable was able to obtain some insider info as well as screenshots to prove that the Digg iPhone app is indeed in the works. 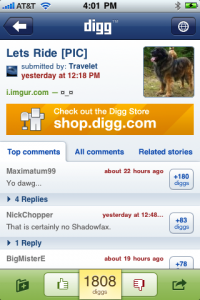 The app would support browsing of popular, upcoming and recent stories across all topics in Digg.com. It will also let you Digg and bury stories right within the app. Plus an option to navigate through comments and related stories. The Digg iPhone app is slated for release anytime now in the Apps Store. The new Digg buttons and widget generators on the other are now both available. What these online tools allow you to do is to create and customize Digg buttons that you can incorporate to your blogs/sites seamlessly. Digg is releasing these online tools in preparation for the launch of the redesigned Digg. But aside from letting you create Digg buttons easily, the buttons that you will create and incorporate in your websites now boasts of new features such as dynamic display of live Digg count, faster load time, customizable look and feel and more. The Digg widgets also gets some other new features including more customization options, tabs and columns, thumbnails, fallback content and more. You can try creating your Digg buttons here, or the Digg Widgets here.